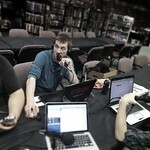 On this episode of MTGYou, Daemon and Rich record a podcast with Daemons phone and in studio Rich Mobile. It’s something to tied you over while James is out of town. We will return next week in full MTGYou fashion. In this episode of the MTGYou Podcast video we talk about standard rotation and a little about the new mechanics for Khans of Tarkir. It’s out with RTR and in with KTK.